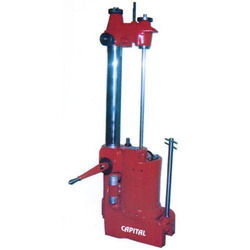 Our organization is involved in offering optimum quality range of Re-Boring Machines. Manufactured at par with the set industry standards, these are known for their dimensional accuracy and durability, these machines are available at industry leading prices. Re-Boring Machine offered by us are backed by precision design and construction support and finds ideal usage in meeting the process needs of re-boring cylinders used in agricultural engines, diesel auto engines, motor cars, motor cycles, brake cylinders, compressors and refrigerators. The extensive product research done by our team allows us to come up with exceptional performance based machine systems at competitive market prices. Further, we also ensure that these boring machines provide for high durable usage as well as resistivity against adverse working conditions. Looking for Re Boring Machine ?